Temple Society of Concord, Syracuse, NY. top: Decalogue over front porch. 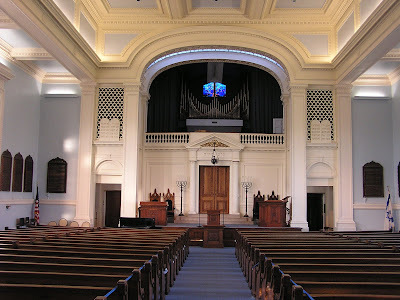 Temple Adath Yeshuran, Syracuse, NY. Top: Decalogue in stained glass window moved from previous syangogue (commonly known as Salt City Playhouse). Bottom: Sculpted Decalogue over modern Ark. This week Jews all over the world celebrate the festival of Shavuot, translated into English as "The Festival of Weeks" (so-named because its date is calculated as 7 weeks after Passover). The holiday commemorates God's giving the Torah to Moses (and thus to the Jewish people)on Mt. Sinai, as described in the Biblical Book of Exodus. The revaluation is summarized as the giving of the Ten Commandments. Visually,the common Judeo-Christian image of the Ten Commandments inscribed on the Tablets of the Law (Decalogue)is a symbolic abbreviation of the narrative of this event. Representation of the Tablets of the law was developed as symbol of Judaism probably by Christian artist in the Middle Ages. The two tablets (a diptych with rounded tops) were frequently represented held by the defeated figure of synagoga / synagogue represented on church facades and elsewhere in contradistinction to the triumphant figure of ecclesia /church with a cross. The same image was sued as a badge that Jews were requited to wear in medieval England. But the tablets appeared in Jewish sources, too, usually in manuscript illuminations of Moses receiving the Law included in Hebrew bibles and other books. Sometimes the tablets are show as rectangular in shape (Regensburg Pentateuch), sometimes they are rounded (Sarajevo Haggadah). These images are presumed to have been made by Christian artists. By the late 17th-century, however, the image of the Tablets became more established within the Jewish world. Starting in Amsterdam after 1675, we see the Decalogue included in synagogues decoration. First the Decalogue, usually with the first Hebrew words of each of the Ten Commandments, was included on or near the Holy Ark (where the Torah scroll itself was kept). By the 18th-century, however the Decalogue moves to the exterior of the synagogue, too, where it is included on facades as a symbol of the Jewish identity of the site, much as across is affixed in front of a church. This tradition became even stronger in 19th century Europe, following Jewish Emancipation in many countries., and it was adopted (with slight variation) by Jews of all persuasions. In America, this became a sort of branding - identifying a synagogue often when there was little else on the building that did so. The Decalogue was seen as a positive statement of the fundamental basis of Judaism. It also was a symbol to which Christians, especially Protestant, could relate. Images of the Tablets also became common in other contexts, decorating the Ark, sanctuary windows, and all sorts of ceremonial objects. The Decalogue eventually became a more common Jewish symbol that the Menorah, which had represented Judaism for nearly 2,000 years. In the 20th century use of the Decalogue has waned as the Jewish Star (Magen David) has become the universally accepted Jewish sign, and one more associated with Jewish nationahood. Jews, too, have more frequently represented the idea of Torah and Torah Law with images of scrolls - the way the Torah is actually preserved, read and studied today - rather than stone tablets. This may be in part due to the rise in popularity of the Ten Commandment tablets (usually with Roman numerals, or the Commandants written out in English) in American Protestant (especially Evangelical) Christian venues. In Syracuse and Central New York there are several examples of the Decalogue used in Jewish contexts. 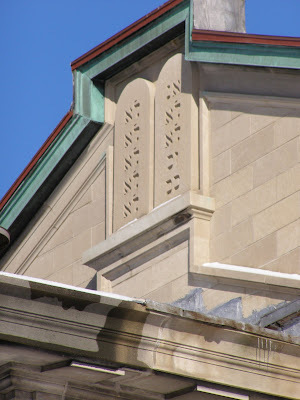 These can be seen inside and out on Temple Society of Concord, the 1911 building at Madison and University just recently placed on the National Register of Historic Places. 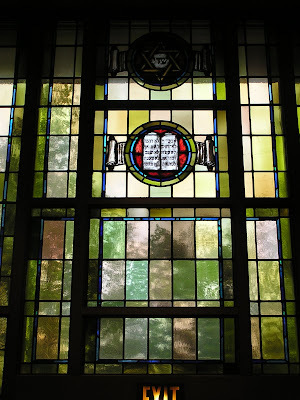 More artistic renderings of the Decalogue can be seen inside of Temple Adath Yeshurun on Kimber Raod (Syracuse), where stained glass windows from the earlier building, and a modern more expressionist sculptural rendering of the Decalogue is on the Ark of the Sanctuary. 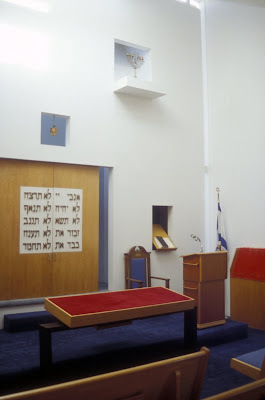 In Cortland, the Ten Commandments appear on the outer doors of the synagogue Ark in the spare modern sanctuary of Temple Brith Shalom (1969) designed by former SU Architecture Dean Werner Seligman. Cortland, NY. 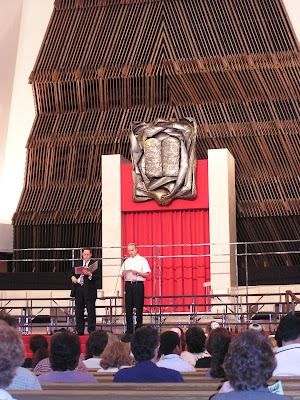 Temple Brith Sholom. Ten Commandments represented on the doors of the Holy Ark. 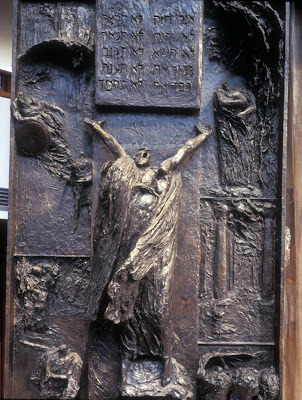 To the west, in Rochester, Syracuse University alumna (and sculptor of the Saltine Warrior) Luise Kaish created in bronze a dramatic representation of Moses receiving and revealing the law, and placed this on the massive bronze Ark of congregation Temple B'rith Kodesh (1962). Kaish was a student of Croatian sculptor Ivan Mestrovic who made several images of Moses during his career. There is also a relief sculpture of Moses holding the Ten Commandments attached to west facing wall of Syracuse University's aw School. But the big striding Moses by Mestrovic set between Shaffer and Bowne Halls has no tablets. Have more local instances of the Ten Commandments? Let me know. Are they in our courtrooms? I'll have to go and check.